So far as I can tell it is about fourth or fifth digital picture frame revealed over the past few years (and currently vaporware), but Taiwan companies Gigazone and Gigabyte have announced the launch of what they say is the "world's first" wireless digital picture frame. The Pixer combines a 6" Carta E-ink screen with an unnamed type of wireless connectivity which is supposed to enable you to update the frame from a companion app. We're a little vague on the details because all I could find was the press release, and it described the Pixer in only the most fluffy and generic terms. 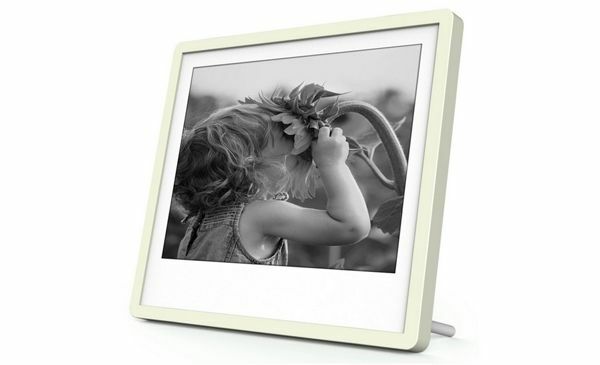 Using an E-ink screen in a digital picture frame is not a new idea; as far back as 2009 Bookeen sold a picture frame where you could insert one of their ereaders before hanging it on the wall. And of course hackers have turned Kindles into wireless weather stations, fridge magnets, and the like (or built one from scratch). Also, there have been several failed prototypes which, like the Pixer, were battery-powered and wireless. One, Vikaura, has been under development for the past couple years. It was supposed to have shipped last fall but is stalled. But hey, E-ink is thrilled to be a part of this project. Dr. FY Gan, General Manager of ESI Business Unit of E Ink Holdings, said, “We are glad to have the opportunity for co-developing Pixer with Gigazone. E Ink is willing to commit to the different types of applications of ePaper. The adoption of ePaper technology into the design of Pixer has made the general public enjoy the feature of ultra-low-power consumption and visual quality with comfort." Who knows, maybe this device will succeed where others have failed. Nintendo’s Next Game Console is Also a Hybrid Tablet – But Can You Read on It? Hey Nate, do you know any specifics whether Vicaura is still going? I’m not a backer so I can’t look into their updates on Kickstarter. It’s still in process, yes. They are running about a year behind schedule, and haven’t shipped yet. I can’t find any sign that it was released, but I did find that they filed the FCC paperwork for a 7.8″ model. GIGABYTE has ended all business of gigazone early this year.So you can not find this product on the market right now….If you are really interested, maybe you can ask to Gigabyte.I know at that time they have volume production and plan to start selling.